Linpack Xtreme is a free tool which functions as a console front-end to the latest version of Linpack, a popular and useful PC stress testing tool. 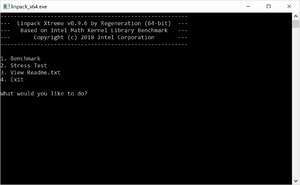 The main point of Linpack Xtreme is to provide a usable interface for performing benchmarking as well as stress testing results with current binaries of Linpack, unlike many other tools which tend not to. Linpack Xtreme can be useful for overclockers, testing the extremes at which their systems will function with acceptable stability. It can use all or just one thread, a set amount of RAM and disable the PC's sleep function while the test is running. For security reasons, you should also check out the Linpack Xtreme download at LO4D.com which includes virus and malware tests. Additional screenshots of this application download may be available, too.